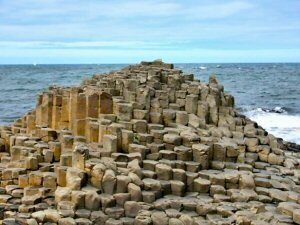 Situated on Ireland's spectacular north coast, the Giant's Causeway is an extraordinary assemblage of geomorphological features, covering seven kilometres of cliff and shoreline. The Causeway area attracts over 100,000 visitors a year, and was designated a World Heritage Site in 1986. There are many ways to access the area but, with high and eroding cliffs in several places, we strongly recommend starting at the main visitor centre, indicated by the co-ordinates at the top of this page. Evening photo of the Grand Causeway feature, looking North. What to see: The extent of your visit is only limited by how much time and energy you have available! There are many different features to visit and walks to explore. A guidebook/map will come in very useful - available at the visitor centre. 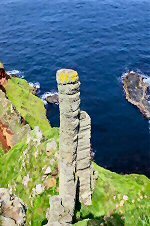 From there, a (free) shuttle bus takes you along the coast road to the “Grand Causeway” from where many other columnar features – such as "The Harp" and “The Organ” may be seen. NOTE: Much of the grassland around the Causeway sites contains rare and specialised flora: please stay on the paths and observe any seasonal restriction notices. How to claim a find: Near to the Grand Causeway, you will find an unusual feature at N55º 14.402 W006º 30.495 (WGS84) Identify this, and discover its “name” in the mythology of the Causeway. Send an e-mail with this information. Please do not reveal the answer in your logs or photographs.Any pictures that reveal the item will be deleted without notice.I will only contact you if you have given the wrong answer. How to get there: From Belfast – take the M2/A26 to Ballymoney. At waypoint N55º 04.864 W6º 30.742 turn onto B66 to Bushmills, then A2 Whitepark Road. The site is well signposted. Admission is free, but a small charge is made for car parking beside the visitor centre. We suggest that you use this car park, because the adjacent road is narrow and carries a lot of traffic in high season, and at weekends. We would like to thank the National Trust Education Office for assistance with this Earthcache. Around 400 million years ago North America and Europe were welded together along a seam that included Scandinavia, Scotland, Ireland and Newfoundland. The two plates then split and diverged and by spreading of the seafloor created the new Atlantic Ocean. 65 to 25 million years ago, spreading of the plates continued and an area involving north-east Ireland, south-west Scotland, Iceland and Greenland were split along numerous fissures. Tremendous volcanic activity pushed material upwards and at weak points molten rock was hurled to great heights and created cones of debris. Where linear cracks occurred in the crust great quantities of molten material welled up from below and flowed out over the surrounding countryside, burying it underneath great sheets of lava, called basalt. 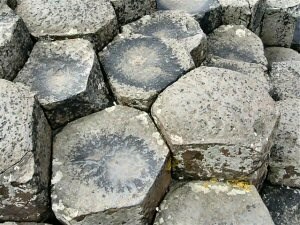 As the molten lava cooled at what was to become the north coast of Antrim, shrinkage-cracks arranged themselves in a prismatic pattern. These are mostly hexagonal, but sometimes pentagonal and other are having various irregular numbers of sides. If you are lucky, you may find the one single column with THREE sides! The basalt cliffs consist of two beds of this columnar basalt separated by a red band of iron ore that formed by the erosion and weathering of the surface of the lava between periods of eruption. Continuous wave attack over the millennia is now exposing the columnar structure and creating the impressive formations we see today. Sources: Mitchell, F. & Ryan: Reading the Irish Landscape, (1997)Dublin. P.Watson: The Giant's Causeway and the Antrim Coast, (1992)HMSO.